Audi A6 Saloon Performance, Engine, Ride, Handling | What Car? The 2.0 diesel is a tad slow off the mark, but only because the standard seven-speed dual-clutch automatic gearbox hesitates when you put your foot down. That's also why it's slower from 0-62mph than a BMW 520d or Mercedes E 220 d, yet once you're rolling and the gearbox has woken up, it's plenty brisk enough and will outperform its esteemed rivals in a 30-70mph sprint. So, the 40 TDI is no slouch and will prove more than sufficient for most people, but what if you're hungry for even more poke? Well, look no further than the 50 TDI 3.0-litre diesel. It's much gruntier across the entire rev range, providing effortless pace if you want to hot-foot it along country lanes or motorways. Our only issue is, again, gearbox-related; this time you get a regular auto 'box (with eight speeds), but it's so hamstrung by its own emissions-reducing set-up that it's hugely reluctant to change down, and that's hugely frustrating if you want to pounce on a gap in the traffic. The 3.0 petrol, meanwhile, is more powerful still and offers the highest performance in the current line-up, but it won't match the diesel's low running costs. There are four suspension options to choose from. Entry-level Sport trim uses conventional steel springs and dampers, S line models use the same, but stiffened and lowered, and there’s the option of adaptive suspension that comes with switchable dampers that can be softened or stiffened to suit your mood. Adaptive air suspension is an even pricier option which isn’t available on the lowest-powered 40 TDI. Both non-adaptive set-ups deliver a supple enough ride over large bumps, such as sleeping policemen, but even the softer non-S line springs tend to thump over sharper-edged potholes. This in itself is not particularly irksome, but it’s what the suspension does after a bump – which is spring back up like a jack-in-a-box – that quickly becomes tiring when you get pitched forwards and backwards in your seat. To avoid such discomfort, we'd definitely recommend you opt for the adaptive dampers. They’re reasonably priced, are available even on the lowest-powered 40 TDI and, despite still being on the firm side, deliver a far more sophisticated balance between control and compliance. They also deal with broken stretches of asphalt more effectively, while also controlling body movements over dips and crests extremely well. But what if you’ve got your heart set on a V6 50 TDI; should you go the full hog and purchase the range-topping air suspension? Well, in most circumstances the air set-up is indeed softer and more compliant than the standard adaptive suspension. However, strike a large, sharp-edged obstacle with any pace and the suspension will produce a forceful thump that feels entirely inappropriate in such a sophisticated car. Factor in an expensive price tag for the air suspension and we’d recommend sticking with the standard adaptive dampers. 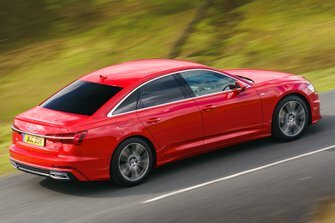 The A6 feels lighter and more agile than its size might suggest and, as a result, nimbler than most of its rivals – BMW 5 Series and Mercedes E-Class included. But not the Jaguar XF, which is still the driver's pick of the class. 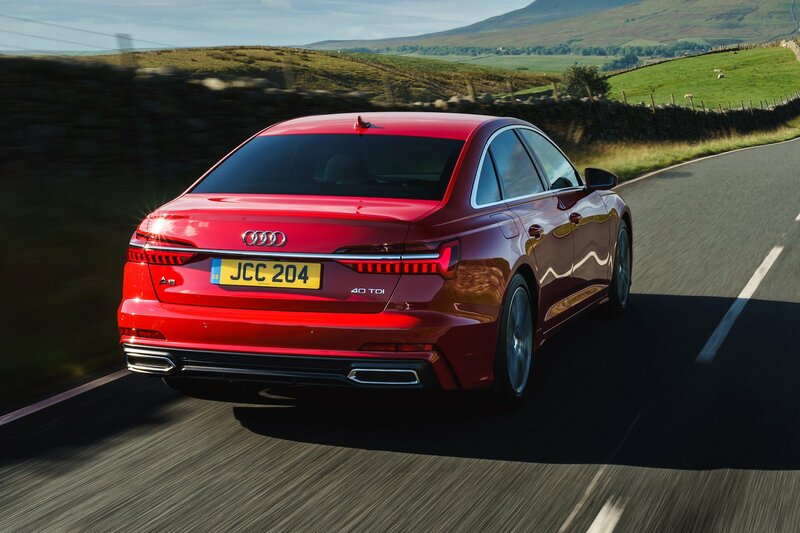 What the A6 lacks in comparison with the XF's delicious real-wheel drive balance, though, is made up for by buckets of grip and a benign chassis that lets you drive it hard with utter confidence in how it's going to react. Take the steering, for example. It doesn't offer the same precision as the XF's, but is predictable in weight and smooth in response. Body roll, meanwhile, is kept under control through corners and during quick direction changes. You can also opt for four-wheel steering on all but the 40 TDI. It tightens the turning circle in town and increases stability at higher speeds, but, while effective, it's too pricey to count as a must-have option. 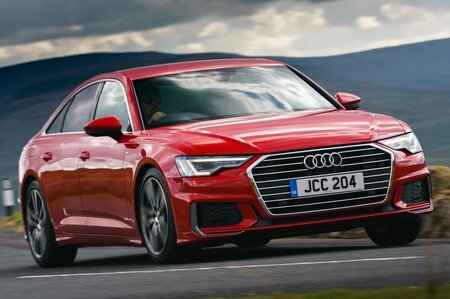 Even if you have no intention of driving like a getaway driver, you'll find the A6 an easy and relaxing car to handle on a long drive over varied roads. All of the A6’s engines provide a generally calming driving experience – exactly what you’d hope for in a car of this kind. In fact, for a four-cylinder diesel, the 40 TDI is one of the best in the business, proving quieter than the BMW 520d and Mercedes E 220 d, particularly around town or when getting up to motorway speeds. The 3.0-litre V6 models are even better. Road and wind noise are all kept well hushed inside, and while you may notice a few engine vibrations through the pedals and steering wheel, they’re very slight. Suspension noise, at least in cars fitted with standard springs and dampers, is much more noticeable than in its immediate rivals, though. The gearboxes are slightly disappointing, too. In the 2.0-litre diesel and 3.0-litre petrol, you get a seven-speed dual-clutch automatic 'box as standard and it can be slightly jerky when parking or in stop-go traffic. Meanwhile, the 3.0-litre diesel has a more conventional eight-speed auto which is better at slow speeds but less refined when you kick it down – it hesitates and then suddenly flares the revs with a substantial jolt. In both cases, the automatic gearboxes of the 5 Series and E-Class deliver much slicker progress.